I like all the cheerful colors and layers. I'm with you - dies to cut out bunnies, flowers, etc are soooo slick! I seldom buy and ss that doesn't have matching dies! Adorable card with lots of layers! Gotta love those bunnies! Cute card and I love the colors!! Amber, these bunnies have so much character they look like they could hop right off your beautiful card!!! Love it!!! Living the watercolor look on bunnies and those now tied are just priceless!!! Such a lovely fresh looking card. I do love this set and that plain Jane stamp too. Love your fun card! The layers all make the colors pop! 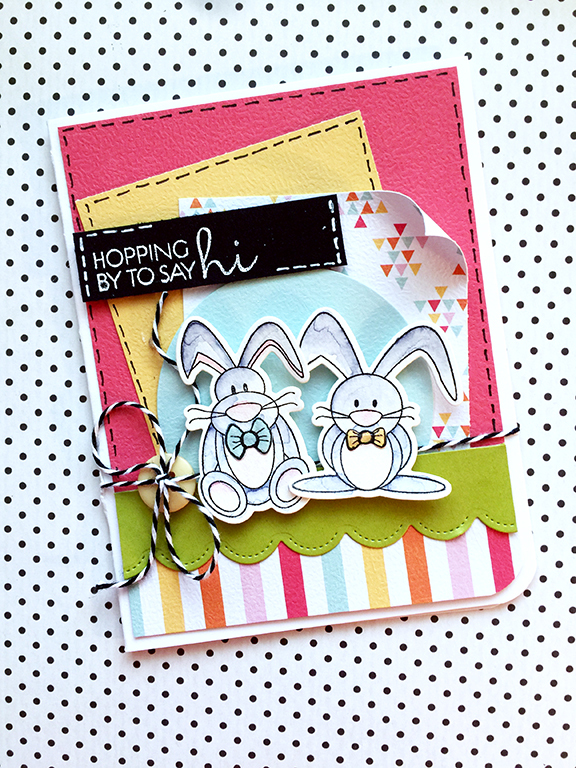 Love the layering on your cute card and the way you watercolored the bunnies! Love their shiny little bows, the curled edge and angled layers! Such a sweet card! 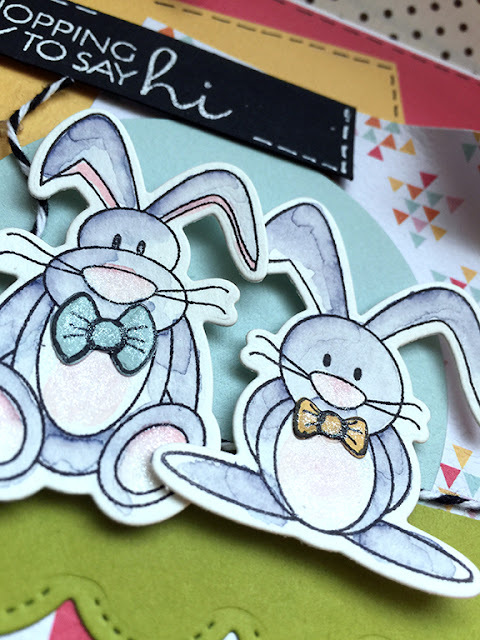 Love how you colored these cute bunnies! Gorgeous card using this new very cute set! Love all the layers, pretty colors used, too. Oh my goodness, your water colored bunnies are ADORABLE, Amber! Love this sweet little card! Just darling! Love the sparkly bow ties! So super cute! What a great layout and design. Great card. Love the watercolors daily bunnies. it's a super beautiful card! Darling card. Love you layers. These Hip Hop Bunnies are so much more great after seeing your sample. Great job. This is just so cute!!! Just love that bunny on the left; he's just adorable! Great card! I love the color scheme and all the fun patterns. What a sweet card. This bunny couple is so adorable. Love their sparkly bow ties. Fun bunnies, love the bow ties and layers. What a neat card! Love the color combo, layers, bunnies and that loose flap...so cute. Love your watercolored bunnies! They look great with bright banners! Such a cool card! Love it! Love the colors you used and the way you put it all together! Darn cute creation with all fab layers! Such a fun card...I love the colors and the layers and the faux stitching. And the watercolored bunnies -- that's brilliant! Thanks for the inspiration. Great layering and I love that little curled corner. Adorable card! What a cute stamp set. I like your crispy edges. How very cute! I love these bunniez. Super cute. Love all the added elements, the faux stitching, curled corner, button and twine. A lovely little card for somebunny. just darling!! Those bunnies are so cute! Totes adorbs!! Love the coloring on the bunnies. Your little bunnies are adorable. Thanks for sharing your cute card. Cute bunnies and fun layers.